We believe that global food production needs to find new and innovative ways of growing. Hydroponics potentially provides a way to grow fully controlled crops. Our hydroponics system closes cycles of water, fertilizer, nutrition and is therefore very environmentally friendly. Within hydroponics, two main systems are usual: Nutrient Film Technology (NFT) and Deep Flow Technology (DFT). IPS offers both systems. 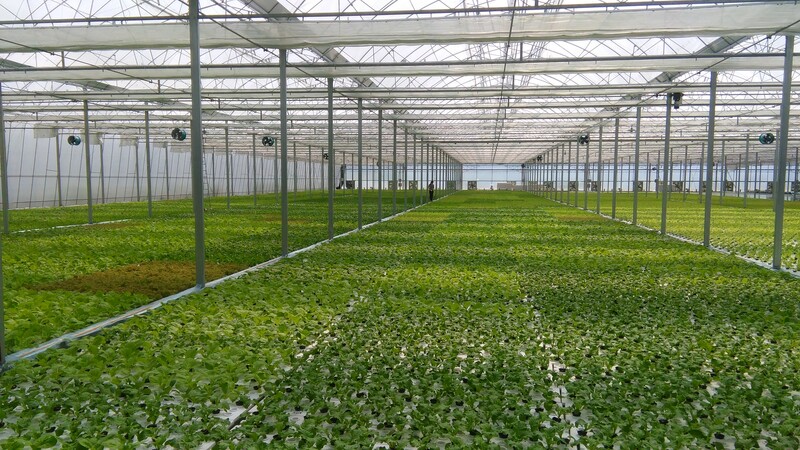 NFT makes use of gutters in which water flows around the crop roots, whilst DFT consists of big ponds in which the plant roots continuously hang. It depends on the climate of the place in the world you live in which system fits best. IPS will advise you which system to use. The development of our systems was completely done within IPS. This results in us being experts in hydroponics. We believe that growing plants using hydroponics asks for courage and an out-of-the-box way of thinking. Therefore, we build growing equipment for every specific growing phase. For example, in collaboration with specialized young plant breeding companies, we developed a patented young plant system, to let the plants root there new roots outside the clot. From day one, the young plants hang with their roots in the water, resulting in fast and efficient growth. Another key issue in hydroponics is the composition of the growing solution. Our fertigation system continually renews and monitors this solution. The amount of water, oxygen and nutrients are always present in the precise amount required. Lastly, the systems of Industrial Product Solutions can be supplied both for manual of automated use. Our manual systems are developed in such a way that they can be automated without costly adaptation.